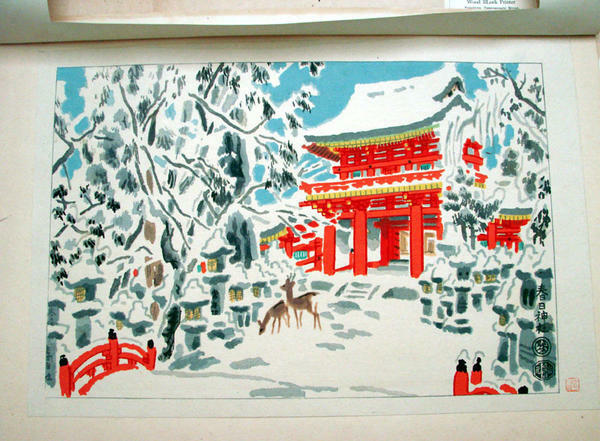 [Go Back] [New Search] Details for Kotozuka Eiichi (1906-) "Kasuga Shrine in winter"
The artworks displayed on JAODB are not for sale. A Complete Set of 1950-60’s Original Japanese Woodblock Prints by the famous artist, Eiichi Kotozuka with original covers, leaflet and beautiful studio designed folder case: From the series, "Four Seasons of Nara". Artist’s chop and publisher seal. Published by Uchida Woodblock Printing Company in Kyoto. A complete set with folder is a rare find and depicts the talents of the artist Eiichi. Each original woodblock print is tipped in their individual original presentation folders which measure 12” x 17 1/4”. “Japanese Woodblock Print” leaflet also included (often discarded or lost). Artist Bio: KOTOZUKA, EIICHI was born in Osaka in 1906. He studied at the Kyoto Specialist School of Painting and in the late 1940s was one of the four artists who founded a co-operative publishing company called Koryokusha in an effort to gain an artistic expression free of the major houses. Tokuriki, Tobei and Tasaburo were the other three involved. He has created quite a number of woodblocks covering unique scenes of Japanese tradition, flowers, landscapes and wildlife. He was a member of the Seiryusha Group of Liberal Artists and Died in 1979. Site copyright: Dr Ross F. Walker. Copyright of the displayed artwork: the original owner. The information contained on this website is provided as an educational resource to scholars and collectors of Japanese art. JAODB would like to thank the caretakers of these art items for their contribution to this database. The items displayed here are not being offered for sale. Unless otherwise indicated the displayed item is not in the ownership of JAODB or Ross Walker.